Andy DeMarco and his little sister Angela worshiped their Uncle Paulie. To them, he was a god, an enigmatic savior, the man who took the place of their absent father, who protected them and their mother, and who taught them about the true nature of life and family. But one horrible summer day something unspeakable happened to little Angela, and everyone’s world changed forever. Now, twenty years later, in the middle of a snowstorm, Andy has returned home to bury his uncle, a man with a shady past that ended with a caper gone wrong and a bullet in the back of his head. Only now can Andy begin to understand who his uncle truly was, and in doing so, finally begin to also understand who he is, and who he may still one day become. Author Greg F. Gifune has crafted a journey of one man’s voyage into the darkness of the past with the pace of a thriller but the poetic and thoughtful writing he has become known and praised for by critics and readers alike. A lyrical, complex and mysteriously enchanting novel that delves deeply into the dark side of family, friendship, love, grief, loyalty, revenge, and ultimately, redemption. 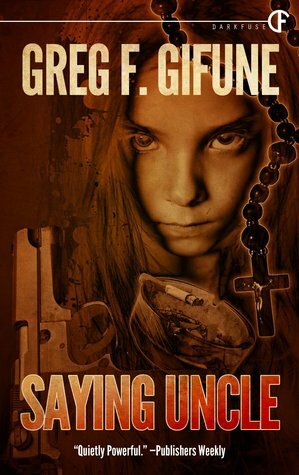 Saying Uncle is a lean but thought-provoking novel about crimes of the past and the scars they leave behind. 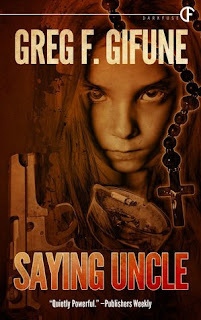 A study of violence and spirituality, of a family torn apart by a senseless act of brutality and the equally brutal aftermath that haunts them still, Saying Uncle is at once elegant, horrific, emotionally shattering, and sadly beautiful. At less than 200 pages, Saying Uncle is a short story and a fast, gripping read. Andy DeMarco is a young man who returns home after many years to bury the uncle who was like a father to him. Uncle Paulie tried to do well by his family, but he was a man with dark secrets. This is an intense and powerful coming-of-age story that explores family relationships, friendship, grief, loss, and the scars left by a brutal crime that happened in the past. It was dark, violent, heart wrenching and beautiful. It got me angry, moved me to tears, and made me feel like a helpless child all over again. It made me think about the father I hadn't spoken to in over 20 years, the two best friends I lost touch with, and the things I wish I had done and said and didn't. Amazing story! Very deep, emotional, and engaging. I hate having to return this book to the library. It is one to savor and treasure.